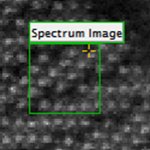 During spectrum image (SI) acquisition, each SI is displayed in its own image display. The spectrum image will fill as the spectral data is acquired and placed into position in the SI. 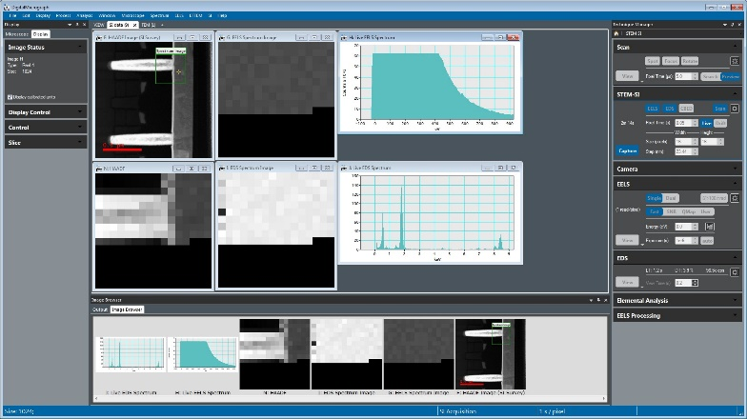 You can use the 3D visualization tools to explore the spectral data while the acquisition is running (e.g., Slice tool), however, since there is a processing overhead for this that may introduce artifacts into your data acquisition, it is advised to do this after acquisition or while paused. 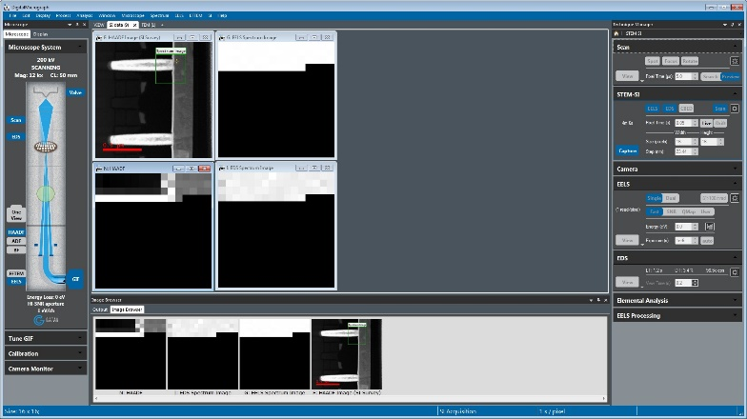 Live spectral feedback during acquisition can be enabled or disabled with the Live button in the STEM-SI palette. You can manipulate the live spectra using the standard tools for line plot display visualization. During acquisition, an orange beam cursor marks the beam position on the survey image. This serves as an indicator of the acquisition progress, and its position may very slightly from that of the beam. Note for particularly fast acquisitions, the cursor is displayed as line or even completely disabled. The actual SI acquisition rate is posted to the DigitalMicrograph® status area at the bottom of the application. It is given in units of pixels per second. This information can be useful when you configure a spectrometer for optimal readout speed. 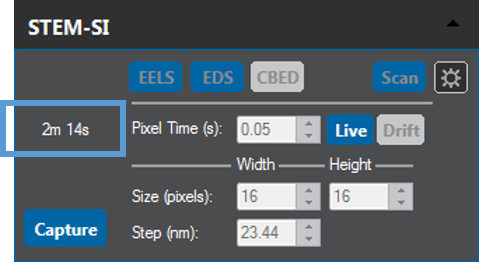 The remaining acquisition time is displayed real time in the STEM-SI palette just above the Capture button. This time is based on the actual acquisition rate, excluding any pauses. How often should I correct for the spatial drift during a STEM SI acquisition? This depends on the amount of drift. The more severe the drift, the more frequent the correction needs to be set up. Note: The drift correction procedure increases the total exposure time for the entire dataset.